As one of the choices for my students' final projects in Intro to Forensic Anthropology at SUNY Cortland back in spring 2008, I had listed an option to map a local cemetery. The one that I had suggested was right across from the Wal-Mart in Cortland, along 13. There is no parking lot, it's sandwiched between two manufacturing facilities, and the gravestones appeared to be in disrepair as ground subsidence caused many of them to sit askew. Only one pair of students took me up on this project, and I summarized their report here. What I found out from them was that this cemetery has been largely forgotten, with the last burial in the 1930s. The town is obligated to care for the property, which has no deed, so someone mows the grass. But they don't have money to repair the stones or otherwise keep up the cemetery. My students, Natalie and Jeremy, mapped the cemetery by plotting the center point of each headstone and each footstone (the latter of which were only in the eastern portion). 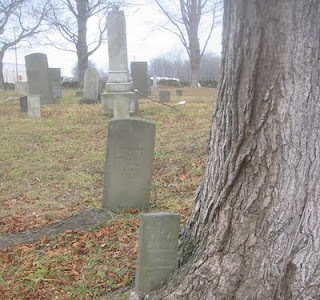 A few weeks ago, a local Cortland man, John Hoeschele, contacted me to see what I knew about this cemetery. It's not on the typical cemetery registries and has very little documentation, although Natalie and Jeremy found some things out at the local historical society. John has taken it upon himself to document this cool little cemetery, which is the final resting place for at least one veteran of the Revolutionary War. John has now taken his website, SouthCortlandCemetery.com, live and you all should go check it out! It's kind of cool that an assignment for a forensic anthropology course was useful for the start of a civic project. I hope that the residents of Cortland take up this charge to preserve their history and help John document and care for this cemetery. You made brilliant tips in this post South Cortland (NY) Cemetery. I just spent some time analysis all your posts and I must say you are a genius who forever throws out stylish opinions.